kimono accessories, zori and tabi. We have beautiful Uchikake Wedding kimono available! Our inventory of Uchikake Wedding kimonos varies by available consignments, so please come in for a visit. 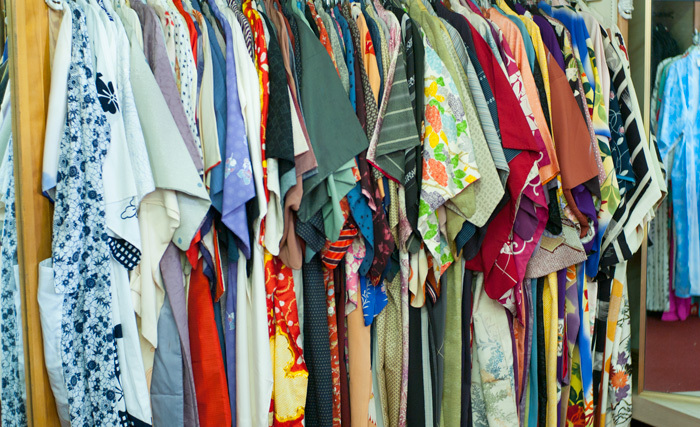 We have a variety of kimonos available for sale, including cotton and cotton sateen kimonos, unlined, and of various lengths. They are available in a beautiful range of colors, so please come see what we have at the store. We have many yukata available at Nichi Bei. Yukatas are lighter weight, unlined, cotton kimonos. They are usually worn in the summer months or for more of a relaxed and casual setting. Happi coats are worn as a lightweight outer garment, like a jacket. They are a mid-length jacket, generally tied with a sash. We have many colors and patterns to choose from. Obi Jime: Colorful royal blue braided cord tied around the midline and in front of the obi. Assorted colors available. Obi Makura: Raised pad or pillow used to shape a tied obi bow. Koshi Himo: a sash or tie used to hold kimono sections in place. Made of silk, polyester or wool. Eri Shin: A long, narrow reinforcing strip that makes the kimono collar stiff. Han Eri: A long cloth used with an eri shin to form a finished collar on the han juban. Eri Sugata: A pre-made eri or collar worn under the kimono. Susoyoke: For women, wrap-around half slip. A single piece of cloth with strings tied at the waist. Date Jime: (narrow or wide): A padded, wide band with velcro tabs (magic belt), to anchor undergarments. Tatami Zori can be worn with traditional Japanese split-toed socks called "tabi." Tabi are 100% cotton, split-toed socks with metal closure tabs at the back. 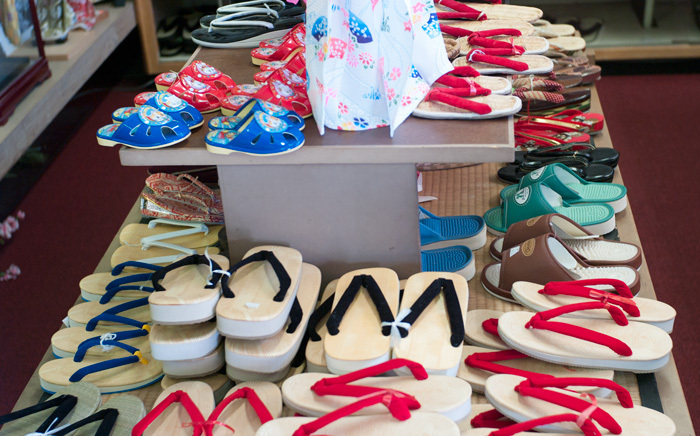 They are worn with Tatami Zori.